Yesterday, a little carried away at the promise of 40 degrees and sunshine, I wore a crewneck instead of a turtleneck for the first time since winter began, a vest instead of a sweater (it'll have to be at least 60, though, before sandals replace shoes). There was a lot of in-and-out of the office yesterday -- more than usual -- and some stinky stuff used in the name of progress which even caused the door to be propped open for a while and, well, 40 degrees is warm when single digits are still in recent memory, but it's not that warm. Having been a little bit chilled all day, I donned a turtleneck and sweater before going to the first-ever meet-up with a newly-formed group of local knitters last night... but which sweater? And what was I going to take for a project? Working from a chart for the mittens while "getting to know you" was not going to work and I don't really have much else going, never mind something "mindless." I had pondered all day what my project might be and even thought of bringing Williamsro to rip out that Blossom part -- that would have made an indelible first impression! So, I was contemplating which sweater to wear, and why, and put on St. Brigid. 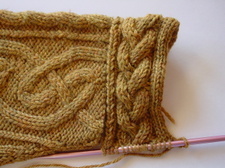 I absolutely adore St. Brigid, as you may know, but every time I put it on, I think, "I've got to lengthen these sleeves -- just one of the small cable bands knit on or attached would do the trick." True to form, that's that thought I had while looking in the mirror last night, making yet another futile attempt to pull down and stretch the sleeves. *BLINK* I had my project -- and wore a different sweater. Tonight I have a book club meeting and one of our members is a midwife... My sister is pregnant and recently looked to me for some guidance and support... I still have the Childbirth and Postpartum Professional Association (CAPPA) website bookmarked in my Favorites... Is this starting to look like resurgence of signs, or is it just me? Another reason that St. Brigid is on my mind is because of a few emails and this picture that I recently received from Willi in Berlin. She wrote last week when I was so blue to cheer me up and, boy howdy, she sure did! She is knitting a St. Brigid look-alike using pictures and her own smarts to figure it out, since the pattern is impossible to a) find, b) afford if you do happen to find, c) not always available through library systems. Willi is making it up as she goes along and I'd say she's doing a mighty fine job of it. It looks like she makes a mean caramel dip, too. Not only is she knitting St. B, she's also Knitting Like A Latvian! Willi doesn't have a blog of her own, so I shall post for her -- another picture of her mittens shall soon be posted over there. Think good weather thoughts for the weekend. I am about the only person in Wisconsin who has been wishing for one good snowstorm yet before spring and, wouldn't you know, there's a threat on the one weekend that I want to travel... 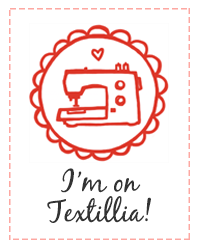 I'm looking forward to some time with my sister, with DH's family at a baby shower, and with Deb and maybe some other Twin Cities knitters over the weekend! I got to hang with quite a few of them last September in Eau Claire when we went to see the Harlot (a doula...) -- but time was too short! The snow can come on Tuesday... bring it on! No snow for southern Wisconsin, please! My cabin-fevered kids want to get out to play! Love the Latvians! Will you have time for coffee or sumthin'? Hope you don't get snow and have a great weekend, your St Brigid fix looks great, you know you can never have too many cables! Hope the travel plans work out for you, you deserve some R&R. We expect snow on Friday so it should be in your neck of the woods on Tuesday. I'll keep my fingers crossed. Those added cuffs look great as do Willi's blue cables. I'm very partial to blues. 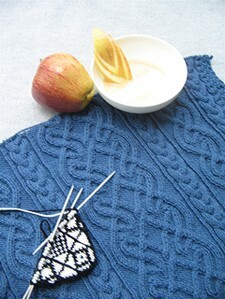 Those blue cables and Latvian mitten start of Willi's is a happy sight. I hope the weather cooperates with you, and I hope you have safe and happy travels! Stop by if you have time! Otherwise just honk as you are flying by on the new bypass! We'll wave back! Wow. Well done on the sleeve. Fabulous mod. I think I like it better! And incredible about Wili! I don't think I have the smarts or patience for that! I had no idea you were interested in becoming a midwife or a doula. How cool is THAT! I know exactly what you mean about the weather, Vicki. We have plans to go out to eat in Lena, Illinois on Saturday and I really, REALLY, want to go – mixed rain/snow, stay away – snow only? Sure, come on over. Good luck with your travel plans! I hope any nasty stuff stays away from where you want to be. It can go south by me. I'm ready with my needles and hot chocolate. The chocolate bread pudding was awfully tempting. Wasn't I good not to eat any? Baby showers....the BEST. I don't like wedding showers, but baby showers Ahhhhhhh, so sweet, so wonderful. You'd think i'd tire of it after being a NICU nurse all these years, but I don't. Its pure magic. We are having spectacular stormy weather here, which means the snow in the mountains that all the skiiers in California have been waiting for is finally here. But it also means stormclouds headed your way, I'm afraid. I'll keep my fingers crossed it waits until monday. And as for the St. Brigid fix...perfect! That's so neat--that you put a new cuff on your sweater. Clever.